Thanks to Marc and Shona Lorrin's book, The Half-Doll, Volume 5, I can now not only correct an attribution, but also add another name to the lexicon of manufacturers. Limbach Porzellanfabrik was founded in 1772, and as late as 1937 was advertising bathing beauty figurines. A page from an old catalogue from this company has been found, showing that the company often used model numbers preceded by "Sp" on its figurines. In 2000, the doll auction company Theriault's sold dolls, figurines, and half-dolls from the archives of Hertwig and Company. These included figurines with the "Sp" mark. 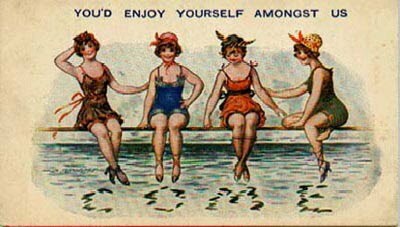 Later, in The Ladies of Hertwig, Theriault's published reprints of pages said to be from original Hertwig factory catalogues, including pages showing bathing beauties and other figurines with the "Sp" mark. Based on this information, I attributed several figurines in my book to Hertwig. It now appears that the following femmes may have been produced by Limbach, not Hertwig. But why did Hertwig have Limbach catalogues and products in its archives? According to the Lorrins, in 1922, Hertwig took a controlling interest in Limbach, which was suffering from financial difficulties. This frisky flapper is pictured in Illustration 06-015 of Bawdy Bisques and Naughty Novelties. She is 4" tall and incised "Germany" and "Sp 432." Pretty in purple, this 3.5" long bisque bathing belle is pictured in Illustration 01-015. She is incised "GES. GESCH." over "Sp1610" and "Germany." Boldly baring her assets in a blue bathrobe, this long-legged lass is pictured in Illustration 06-013. 5.5" tall, she is incised "Germany" and "Sp 594." Illustration 27-001, this lounging lorelei is 5" long and incised "Germany" and "Sp 1274." 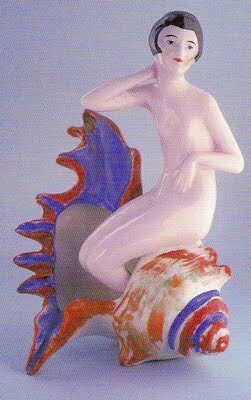 This china siren sitting in a seashell is pictured in Illustration 27-020. She is 5" tall and incised "Germany" and "Sp 1116."